Let’s say you spend days, weeks, and maybe even months picking out the perfect tile for your kitchen floor. This is the room you’ll walk into every morning, noon, and evening, even to grab those midnight snacks, for the rest of the time you own your home. It’s an important decision, right? Now that you’ve found that beautiful tile, and can imagine how fantastic it’ll be once you replace that old, stained, and dirty linoleum, what choice is there that you may have forgotten? The GROUT, but what does grout have to do with your perfect floor? Although you have the tile, choosing the wrong colored grout can turn that dream floor in to a real disappointment. 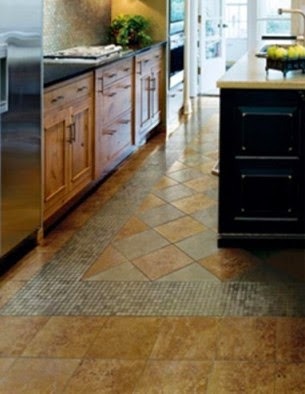 Do you want the floor to clash, or do you want that floor to cause each and every tile to complement each other? In either case, you really need to consider the grout’s color, because it can make or break that dream floor. If you want to put emphasis on each tile, then choose a grout color that contrasts the color of the tile, in a more or less complementary fashion to match the surrounding colors perhaps, depending on your taste. If you choose this route, the grout’s color will act as a frame for each tile, giving the look or appearance of a grid-styled floor. For a more uniformed and symmetrical look, choose a grout color that’s a close match to the color of the tile itself, this will cause the room to appear bigger. On the other hand, choosing a grout color that’s blatantly different than the tile color will give your floor a kind of asymmetrical/retro look that’s just right for you! Remember, the grout you choose is important, make sure you talk to your flooring specialist to get some ideas so that you end up getting the grout color that’s a perfect match, for you!